The Lombard Company is experienced in building educational facilities for both colleges and universities. Our quick turnaround capabilities and careful attention to detail ensure your classroom addition, dormitory or other building project is completed as scheduled and to your complete satisfaction. The Lombard Company would be happy to work with you as the general contractor on your next project and is certain you will be more than satisfied with the results. After reviewing Lombard’s educational experience, High School District 218 Awarded The Lombard Company the contracts for improvements on three of their high schools. The Lombard Company completed a remodel and constructed an addition to the cafeteria. Improve safety standards including installation of a major emergency generator, new exit signs and emergency lighting. This project involved many energy efficiency upgrades. These including removal of two old boilers and replacing them with five new high efficiency boilers. The project was completed over Mother McAuley’s summer break. The project involved extensive renovation to the school’s cafeteria and dining areas. These area were gutted out and all new finishes were provided including terrazzo floors in the dining areas and sheet vinyl flooring in the cafeteria. Air conditioning was added to these spaces. These areas were also completely reroofed. All work was completed on time and within the owner’s budget. Lombard’s devotion to thier clients is demonstated by Mother McAuley’s selecting Lombard for many projects over the years. For four consecutive years (2004-2007), The Lombard Company has been chosen by Holy Trinity High School to complete their summer renovation work. This 2007 project included computer room renovations. 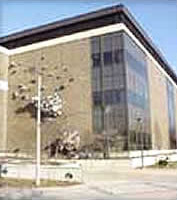 The 2006 project included renovations to the main gymnasium and the faculty lounge. The 2005 project included renovations to the locker rooms, a fitness center and a new meeting room/conference room. Holy Trinity’s repeated selection of The Lombard Company is a tribute to the high quality of work performed by our firm. The Lombard Company completed the nearly $3,000,000 renovation work to their gymnasium and locker room facilities. Lombard also put in place the mechanical and electrical plants for future additions. Lombard’s extensive experience in construction and renovation for schools was a major factor in their selection for this project. Morgan Park Academy is a private school in the Morgan Park neighborhood on Chicago’s southwest side that includes pre-school through high school. The four-story addition to the existing Engineering Building added an additional 120,000 square feet of research and laboratory space to the University of Illinois at Chicago campus. The $21,000,000 project included a 3,000 square foot Clean Room that, when built, was the largest in the Midwest and one of only 15 such rooms in North America. The Clean Room provided a dust and static-free environment, with state-of-the-art temperature and humidity control, to facilitate research of electronic devices. The Technology and Business Center at Joliet Junior College is a state-of-the-art building that brought high tech to JJC’s educational and business conference environment. The $7,000,000 facility added 100,000 square feet of classroom and conference room area to the JJC campus. The two-story facility has an architectural precast concrete facade, provided by Lombard Architectural Precast Products Company, together with a two-story glass and aluminum curtain wall entry. The Family Development Center at Governors State University is a 32,000 square foot facility originally intended for preschool and daycare activities. The $5,800,000 project presented special layout and coordination challenges for The Lombard Company. The front wall of the facility is a poured in place concrete wall that is curved with a 655 foot radius, and slopes from 15′ to 22′ across the front of the building. The wall is punctuated with a number of window openings in the form of truncated squares and ellipses. The building is also a compendium of geometric shapes, with the architect utilizing an ellipse, rectangles, squares and various quadrilaterals to shape the building footprint. The exterior of the building also features a variety of finishes, including sandblasted concrete, glass curtain wall, EIFS, vinyl siding and standing seam siding. The building plan also includes three functional greenhouses. The Lombard Company provided general contracting services to School District No. 130 for the construction of their newest school in Alsip, Illinois. The two story, 35,000 square foot masonry building has a truss roof and structural steel interior framing. It includes a multi-purpose activity room. The Lombard Company was awarded the contract and the project was completed on schedule. The Lombard Company provided general contracting services to Southwest Cook County Cooperative Association for the construction of a 14,600 square foot, one story, masonry and steel frame building addition, including site work. Construction commenced in mid-winter and was completed the following August. Since the addition was built while school was in full operation, particular attention was given to student safety. The project was completed under budget and on time for the school season, and offers its special children an enhanced curriculum. The Lombard Company provided general contracting services to Calumet City School District No. 149 for the construction of a new commercial kitchen which will serve the entire school district and link the existing school to a new 50,000 square foot addition. The Lombard Company provided general contracting services to the Harnew Elementary School in Oak Lawn, Illinois for Ridgeland School District 122. This was a two-phase project. Phase I involved the construction of a 48,000 square foot, two story school addition. Phase II involved complete renovation of the existing school. Total contract value for this work was $9,500,000, which included approximately $3.1 million in separate mechanical, electrical and plumbing contracts. Construction work was safely completed while the elementary school was in full operation.